Baguio City — The aspirant who wants to be a disciple of Jesus should ask the blessings of the Holy Spirit before he begins the “gargantuan task” that awaits him. This was the content of the homily given by Fr. Bernard C. Amparado, OAR during the traditional Mass of the Holy Spirit he officiated at Casiciaco Recoletos Seminary last August 11, 2018. The rector noted that when one enters the seminary, there were fears and apprehension. The seminarian comes face to face with his insecurities and vulnerabilities, and the experience of trepidation is repeated year-in-and-year-out as one goes up the ladder of formation. “And so we need Someone to appease us, to assure us. That is why we invoke the Holy Spirit and pray for strength, wisdom and creativity,” Fr. Amparado said. “It is the Holy Spirit who will make us discover the gifts God has given us and to make us discover the path God has called us to tread,” he added. After the homily, the religious formators and lay professors made their Profession Fidei (profession of faith). 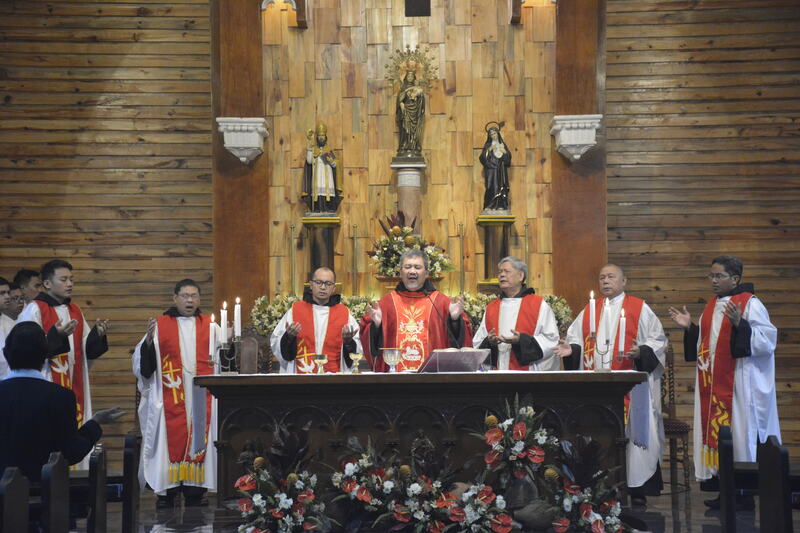 The Mass of the Holy Spirit traces its roots to the special liturgy in the 12th century invoking the Holy Spirit before the start of a “common aspiration” like classes and seminary formation, the rector said. For this year, there are 67 seminarians in Casiciaco, 23 of whom are neophytes. There is also a shakeup in the lineup of formators beginning this year. While Fr. Amparado is still Rector and Prior of the House, Fr. Anthony Irineo, OAR now assumes the Vice Rectorship and serves as Dean of Studies, Senior High School (SHS) Principal and School Registrar. The Prefects of Discipline also swapped places. Fr. Ralph Ciceron, OAR is the new Prefect of Discipline for college seminarians while Fr. Bob Cabanag, OAR is the main disciplinarian of the SHS seminarians. Fr. Joseph Philip Trayvilla, OAR channels his inner spirituality by taking on the post of Spiritual Director (SD) for college seminarians, a task he shares with newcomer Fr. Ken Lao, OAR who is the designated SD of SHS seminarians. Aside from spiritual direction, the seminary now offers guidance and counselling to seminarians by welcoming into the Formation Team the Order’s veteran Guidance Counselor, Fr. Federico Gregorio, OAR. The former president of UNO-R in Bacolod City, Fr. Eduardo Celiz, OAR, now serves as the seminary’s procurator, a post formerly held by Br. Raymund Alcedo, OAR, who now calls Recoletos de Cavite his new home.